Abstract: Pituitary abscess is a rare but critical disorder caused by an infectious process where purulent material accumulates inside the sella turcica. 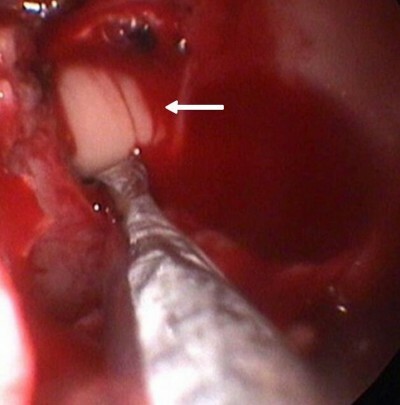 Since symptoms, signs and radiographic characteristics of pituitary abscess are similar to several other pituitary lesions, correct diagnosis before surgery is challenging. In this article, two cases of pituitary abscess treated in our department are reported, followed by a literature review. In these two cases, both patients presented with intermittent fever. Magnetic resonance imaging revealed a suprasellar lesion with rim enhancement after contrast injection. After transsphenoidal surgery, the diagnosis of pituitary abscess was confirmed. The patients were then given antibiotic treatment and recovered fully in less than 2 months. Findings of this article support timely diagnosis and proper treatment including transsphenoidal surgery and antibiotic therapy for pituitary abscess, leading to lower mortality rates and higher probability of pituitary hormone function recovery.